Although Labor Day is not the official end of summer, it does cause us to reflect on some of the season’s best memories. And, for the Convince & Convert blog, that can only mean one thing – a summer social media #TBT. Inspired by some of the great video campaigns launched this summer, here are three examples to propel your social media efforts well past the warm weather season. Make sure to plug in your headphones or close the office door and turn up the sound to fully experience these video campaigns. Proclaiming it the “summer of sharing,” Coca-Cola turned to its passionate social media community to raise awareness for the launch of custom #ShareACoke bottles and cans in the United States. While the Coca-Cola team did a good job partnering with top social media content producers like Cameron Dallas to spread the word, the shareability of the campaign also lead to a few unknown viral sensations. For example, this clever video produced by a couple used the #ShareACoke campaign as a clever way to make a pregnancy announcement, generating a whopping 4 million plus views to date. Key Takeaway: Embrace a mix of your top brand advocates and well-known influencers to co-create video content to tap into the power of word-of-mouth endorsement and social media sharing. Also, make sure to reward and celebrate fans who go above and beyond for their participation, like Coke did when it sent 360 cans of Diet Coke to the couple in the video as a thank you. 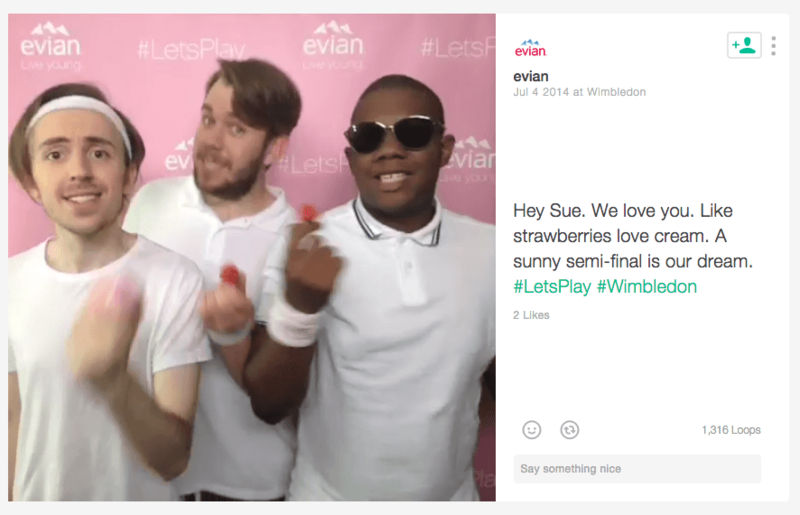 To maximize its sponsorship around the popular summer tennis tournament Wimbledon, Evian hit the right tune with fans by translating their tennis match tweets with #LetsPlay into mini music videos on Vine. The Vines were personalized to the individuals who submitted them and shared throughout the closing week of tournament with the help of acapella group Vive Vocals. The Vine campaign was part of a series of ongoing video content throughout the tournament, from a music video with Maria Sharapova, to celebrity ping pong, and more. Key Takeaway: Use personalized Vine video responses to tap into the Social TV conversation around a show or event to add an unexpected and entertainment element for viewers and fans. In a social media landscape marked by brevity, this five-minute video from Beats By Dre titled “The Game Before The Game” surprised and inspired many World Cup fans – all without being an official sponsor of the event. From the musical score, to the motivational words and scenes featured, the video tells a powerful story and captures the viewers’ attention for the duration, which is no small feat in today’s time crunched world. With more than 24 million views to date, this video has reached an impressive number of people. Key Takeaway: Focus on the power of the story, messaging and supporting elements that bring a great video to life. Don’t let length get in the way of an amazing content and storytelling opportunity. Different lengths can always be cut for specific mediums.